Perfect for lunchboxes and special snacks! 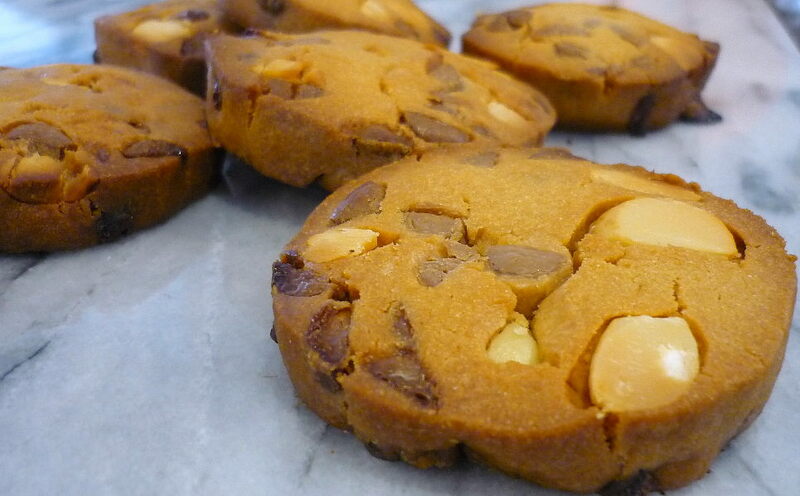 These are a sweet toffee flavoured cookie with plenty of crunch. Soften sugar and butter and whip together until very light and fluffy. Add eggs and vanilla, mix well. Add flours, salt and baking soda to sugar/egg mixture, add milk if required. When well mixed, add chocolate chunks, and nuts. Mix into a thick dough, form into a log and wrap in plastic wrap and refrigerate for half an hour. Slice the log with a sharp knife, making thick, generous cookie discs. Bake for 10-12 minutes or until slightly brown on top - a little bit longer if you want a crisp toffee style cookie.